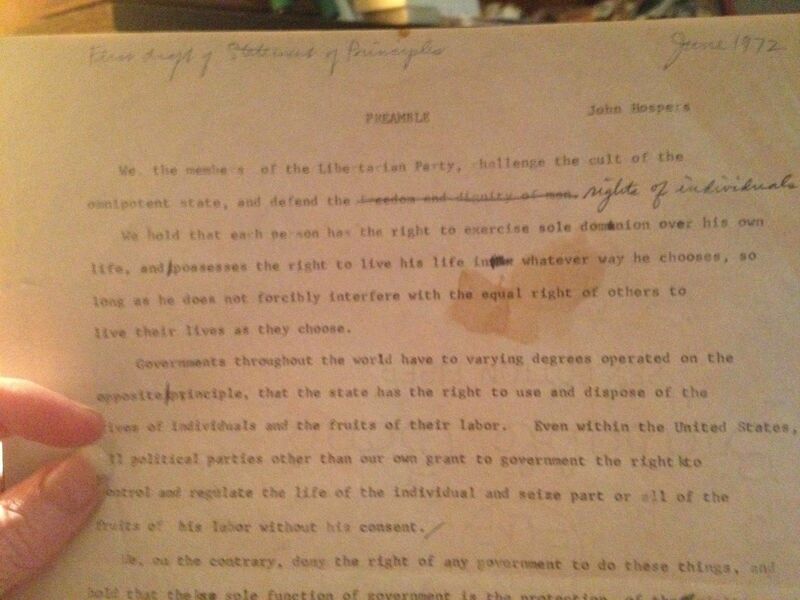 By an extraordinary confluence of events, the Libertarian Party Historical Preservation Committee has come to be in possession of the original typed draft copy of the Statement of Principles as written by John Hospers. Originally, LPedia had housed a poor scan of this document from an unknown source and the location of the original had been unknown. This scan can be viewed below at the highest resolution that existed. 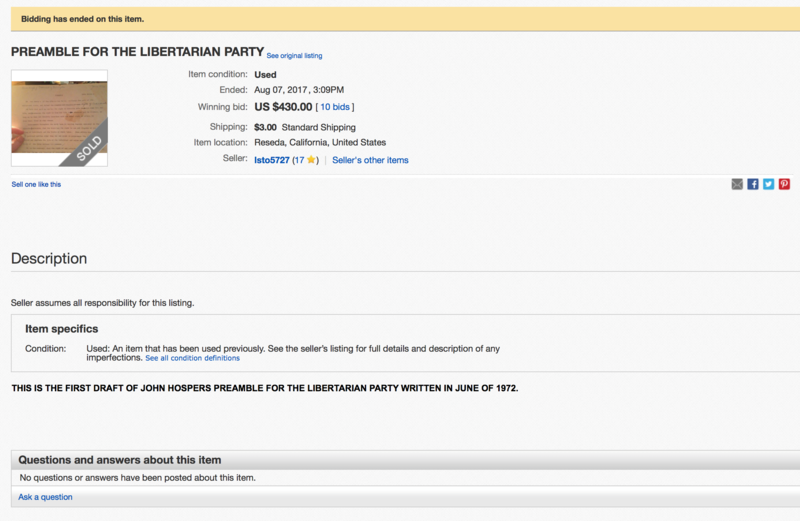 On August 4, 2017, Caryn Ann Harlos was randomly checking eBay for historical Libertarian Party items and saw that the original typed document was being offered for sale. Excitement ensued. Several known LP historical enthusiasts were bidding but it seemed at the last minute an unknown bidder snapped the item up at $430.00. After some despair and self-consolations, it was revealed that fellow group member Lellius Rose was the final bidder as he wanted to ensure that it was obtained and donated to the Party. 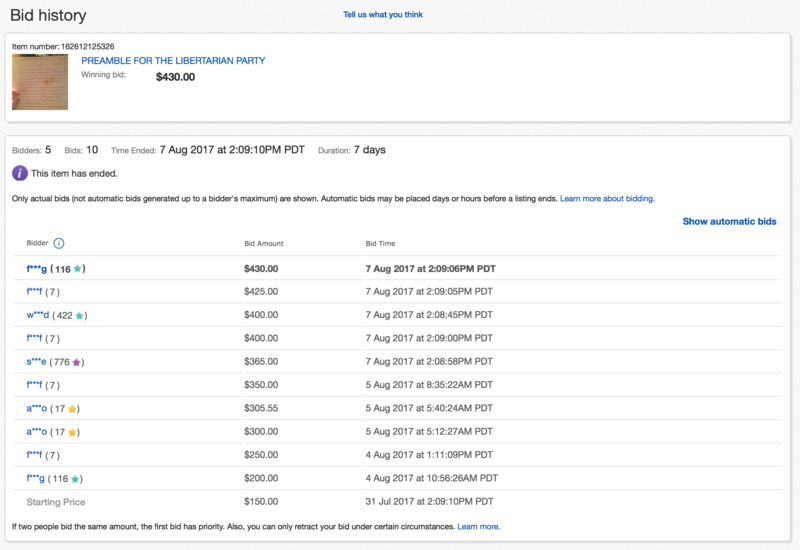 On August 12, 2017, Laurie Stover, the seller of the item, provided this background information. I'm more than happy to tell you about it. My mom, Shirley Gottlieb, ran the libertarian party office out of her home in the 1970's. My mom and dad had many meetings at their home and came to personally know Dr. John Hospers. I remember being in high school and coming home to a house full of people in the living room. My mom recruited me to go to downtown Los Angeles to help count votes when the party was trying to obtain ballot status. I didn't know that my parents even had it. I've been going thru the house after my dads passing in March, (I lost my mom in 2005), and came across a picture frame containing a black and white photocopy of Ayn Rand It seemed odd to me because it wasn't even a photo. More like a photocopy and I couldn't understand why they would have framed it. When I took it apart I found the document you now have!! Here is the original document (click here for fullest resolution). It is unknown if the coffee stain is original or occurred later on. It is obvious that the prior low-quality scan is of the same document. There is still some mystery about its travels but many holes have been filled. ↑ It was uploaded by James Gholston in 2011 but he did not know the original source. This page was last edited on 3 July 2018, at 13:36.